The Night Mother is the Unholy Matron, bride of Sithis, and spiritual leader of the Dark Brotherhood. According to Dark Brotherhood beliefs, she is the wife of Sithis and bore five children. Despite being a relatively powerful spirit, her corpse is needed for communion with her. She receives prayers from people seeking to arrange assassinations via the Black Sacrament, and relays those desires to the Listener, the mortal leader of the Brotherhood. However, since the destruction of the Brotherhood in Cyrodiil, and the death of the Listener in a riot, the last remaining Skyrim Sanctuary has been cut off from contact with the Night Mother. 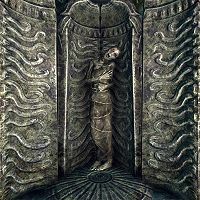 Without a Listener to guide the Dark Brotherhood in the way that the Night Mother wishes, Astrid has taken complete control of the Brotherhood. They have eschewed the tenets and traditions of the Dark Brotherhood, and to many are considered no better than a group of mercenaries. Although the Night Mother is no longer respected as she once was, she has a plan to help change this and restore the Brotherhood to its former glory. The Night Mother is being transported by Cicero to the Falkreath Sanctuary when his wagon wheel breaks and they are stranded together near Loreius Farm. Cicero and the Night Mother will make it to the Sanctuary with or without your help, and will live there until the destruction of the Falkreath Sanctuary. After the quest Hail Sithis!, she will be transported to the Dawnstar Sanctuary by Babette and Nazir, where she will remain indefinitely. She is not technically an NPC. She is implemented as a talking activator, meaning she is just an inanimate object with some associated dialogue. Therefore, she does not have a race, health, magicka, FormID, or any other statistics normally associated with NPCs. However, she will shed red blood if her corpse husk is attacked within her coffin with a bladed weapon. In Oblivion, the Night Mother's remains were merely a skeleton. However, 200 years later in Skyrim, they have a mummified look. When she speaks to you her corpse will appear brighter than normal. Whispers in the Dark: Spy on the Night Mother's keeper to see if he is planning sabotage against the Brotherhood. For historical information on the Night Mother, see the lore article. This page was last modified on 13 November 2017, at 14:53.